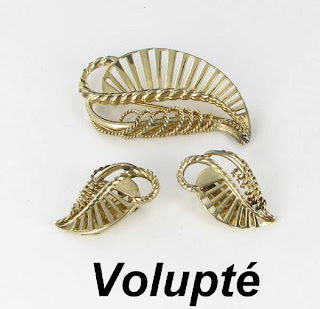 Volupté is a company which was founded in 1926 in Elizabeth, NJ. They are most well known for their extensive range of compacts. The company also produced jewelry, chatelaines, purses, and cigarette cases. They were one of the most prolific manufacturers of ladies compacts and had every imaginable shape and design in their product line. The company ceased manufacturing in the late 1950s. However, the company's jewelry line was only produced for only a very short period of time and is quite rare and hard to find. I have just procured a wonderful demi parure from a recent estate purchase by Volupté and have listed it in my Ruby Lane shop Finishing Touch Vintage Jewelry. The demi consists of a brooch and matching pair of clip back earrings in gold tone metal fashioned in the shape of a leaf with interesting gold tone rope swirling details. Price is $85, or you can make me an offer. True collector's pieces. 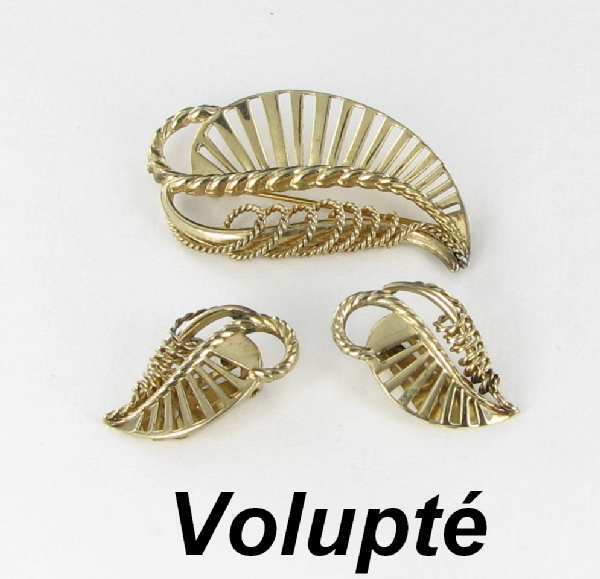 You can see more details and pictures on the Volupté demi item page.